This little girl yearling is having a hard time waiting for the dusk reunion. Only in the last of the three clips is her yearling companion’s presence detectable by its ears moving. Those ears are near the ground at the right edge of the bush near which the one is standing. My coyotes rendezvous daily around dusk in the same place and have been doing so for the four years I’ve been watching them. They don’t all arrive there at the same time. I’ve often seen one or two family members waiting for others to show up. Once all are together and joyful greetings exchanged, the pack trots away together. I’ve seen some wait for two hours and more, sitting or ambling around. While waiting for each other, I’ve never seen them hunt. The time they spend waiting looks pretty boring for them. The yearling in the video is passing time by walking around with a stick in its mouth. In the distance to camera right, humans jog and bicycle until it’s time for them to meet up with friends and family for the evening. 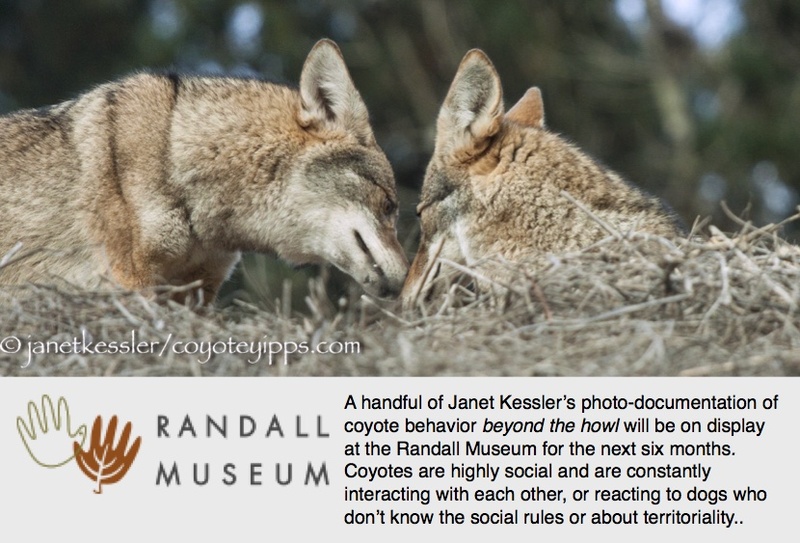 For humans and coyotes, social contexts are essential. Individually, coyotes eat small prey and consequently could exist as solitary hunters. Yet coyote food security comes from holding territory and a solitary coyote can’t hold territory. A coyote couple can; and a coyote couple can only raise a family by holding territory. Within that territory, coyote family members don’t depend on group hunts to get food. However coyote families do depend on family members to hold territory. Without family there is no territory and without territory there is no food security for coyotes. Family is food security for coyotes and territory is family. Within the bond of a coyote couple rests their food security. It is no wonder that a Chicago coyote study researcher has noted no cases of coyote divorce. My Mom and Dad coyotes fundamentally know that eating has been really good since they met, just as good as when they lived back in the homes of their respective parents. In essence, they are each other’s promised land, they are an abundance to each other that only death can put asunder. Still in its own parents promised land, the yearling was at a comfortable distance from me. It didn’t feel its territory was being compromised and didn’t need to defend it. Its backward glance at me confirmed that I was staying put and that it could keep walking around with its stick.